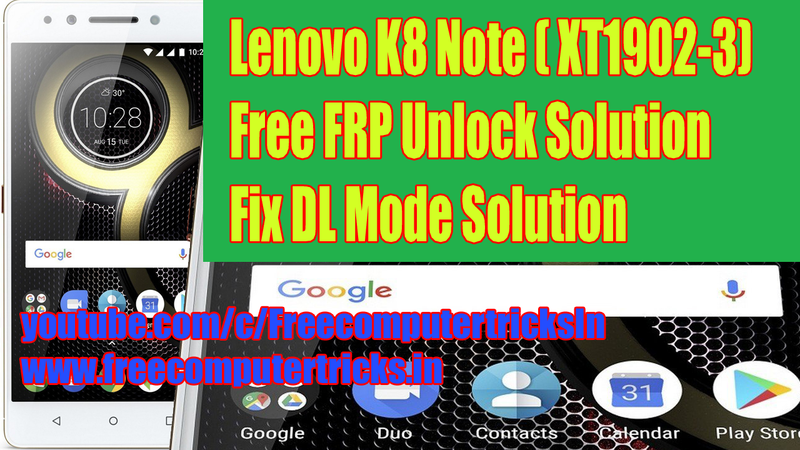 Lenovo K8 Note ( XT1902-3) FRP Unlock Solution and Fix DL Mode - Use Free Unlock Tool Miracle Box V2.58. Yes here is the procedure, how you can unlock or bypass or remove or reset frp of Lenovo K8 Note XT1902-3 using a Lenovo Free FRP Unlock Tool 2018, which is Miracle Box and it's working without Box, so you can use it free and unlock your Android smartphones. This software can be download from Internet, just search on Google and download the free frp unlock tool or here in this site you can also get the Free Latest version of Miracle Box working without Box, to download from this website, please search "Miracle Box" in the search box and find the download link. After frp unlock you may face "Tool DL Image Failed" on the Lenovo boot screen and your device may be continuously restarts, and in that case you must need to solve the error Tool DL Images Failed to get back to normal boot up, so here also we provide how you can solve the Tool DL Image Failed using SP Flash Tool (Smartphone Flash Tool) and a small zip file which helps to recover the phone using the file after extracted and Fix DL Mode using SP Flash Tool. So let's start how to solve the both problem one is Lenovo K8 Note FRP Unlock and Lenovo K8 Note Tool DL Image Failed, please go through the below. 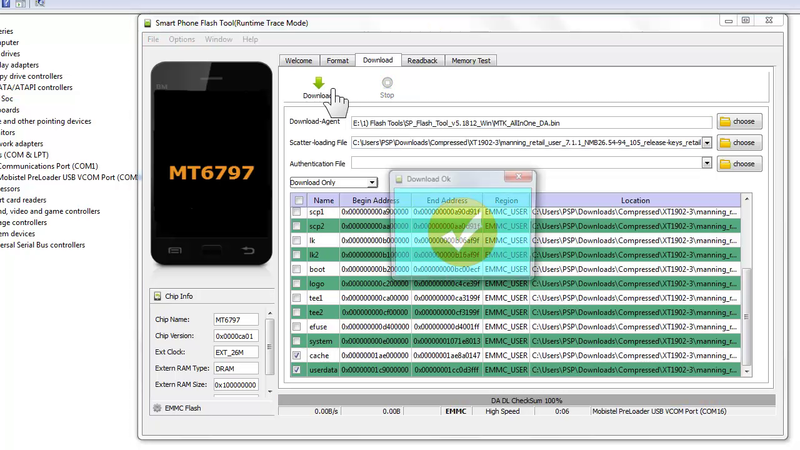 As it is MediaTek phone you can use any flashing box to unlock frp of the phone, but here we show how to unlock Lenovo FRP using free tool and 100% tested result, which proof the success report of Reset FRP using free tool, MediaTek (MTK) phone can be unlocked by using Miracle Box and here we will show the free procedure and free tool to unlock FRP. Then go to MTK Tab and select "Reset FRP" and click on Start Button. Why I Need To Unlock FRP Of My Phone? If you do hard reset or factory reset of any Android smartphone having Android version 5.0 or higher, then in that case you must need the Email ID and password of your Google account to reactivate the phone and make it usable, otherwise you will stuck on the Wi-Fi screen or Enter your Google account details which synced before on that phone page. So what we got that is if we forgot the Gmail Account details or Google Account details, and without remember the id password, if we do a Factory Reset of the phone after switching on if will ask to enter your Email id and password to pass the Google reactivation process. So in that case you must have to do a FRP Bypass to use the phone and here is the complete procedure for you to unlock your phone. Note: Only follow this tutorial if the phone belongs to you, otherwise do it at your own risk, as this tutorial is purely for Educational and Tutorial purpose. Some version of Lenovo K8 note may not be supported with this process and to solve DL image failed please go through the below solution. Then go to Download and select "DA DL All with Checksum" and flash the phone with below file to solve Lenovo DL Image Failed. So in this way you can easily solve the Lenovo K8 Note XT 1902-3 Android smartphone issue, here you will get the download link of all related tool and drivers and free unlock tool for your Lenovo phone also get the "Tool DL Image Failed" repair file to fix the DL mode of the phone.